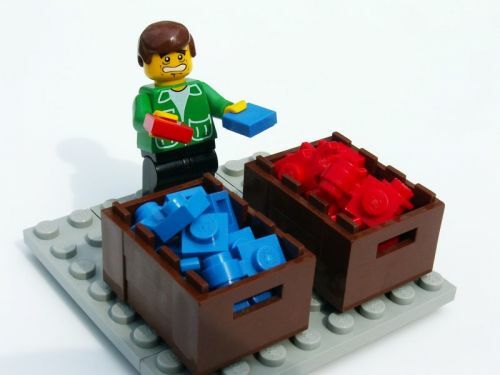 If you own one LEGO Set, DO NOT buy another one because the in the very moment you own two, you will want another and another and another and eventually the day will arrive that you will need to sort that mesh. You can follow my steps and do the work yourself, like I did with my Technic stuff… or you can let machines do the work for you. So without anymore wording here they are, the very best sorting machines out there in no particular order. These constructions are are really ingenious. Let me try to explain you how they works. I haven’t built any of them but I think I understand the overall behind all of them. Here the principle of this construction. Axles are placed on a bucket where they are pushed one by one and placed on moving trays. Under that moving tray there is a base that it is smaller each time. The bigger the gap the sooner the long axles fall. This is pretty much the same idea than before and even simpler. You can see now that when a bit more than half the beam is on the air it falls on the bucket. As I said before it is pretty clever. I am not completely sure about this one, but this is what I think. The rolling container is a masterpiece of design, you can see how it is done on the inside so it gets a few pins on each roll and drop them on a central repository where there is only room for one at a time, from there it exits the container and it moves under a color sensor ( that black and yellow box ) where the Mindstorms decides which kind of pin it is. Then, if you look at the motors you will see that there are three motors to control six buckets and if you recall the pneumatics part to that can be used to take air to one or other entries… and you think a bit… you will realize that each motor controls two pneumatics pipes and then blowing each axle it is dropped in the bucket. Quite clever. Well, now we have serious stuff here. We have the bucket were parts are stored, a paper track where parts fall and from there moves to… blue lighted zone that has over there a webcam that takes a picture of the part, the part is analyzed in a computer and then there is a set of buckets that are rotated until the correct one is under the track, when it is in position a black beam push the part into the bucket. If you thought the above one was crazy, this one is simply genius! Using no Mindstorms this excavator place bricks on different buckets by its size. How?! Do you know another crazy sorting machine? Write me a comment and let us see it! And if you enjoyed this post, please share it. Amazing sorters! I’ve already seen some of them, but it’s always amazing to see more! P.S. Is something wrong with your RSS feed? It never shows the full post and I have to go to the actual blog. It was configured as a summary. Now it is set for full post. Nice to see our pin sorter making it on your list!